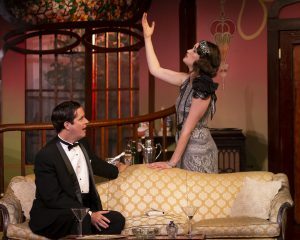 The Classic Theatre Festival in Perth opened its 9th summer season June 22 with a rediscovered comic gem, John Van Druten’s There’s Always Juliet. Playing at its wheelchair accessible, air conditioned 54 Beckwith Street East venue, the play embodies much of what makes unique the Festival’s mandate to produce hits from the golden age of Broadway and the London Stage. “We pick plays that bring back fond memories and sensations, like the feeling you get when you watch the film It’s A Wonderful Life every December with your friends and family, or you hum along to a wonderful Ella Fitzgerald song,” says Artistic Producer and Director Laurel Smith. There’s Always Juliet asks whether love at first sight truly exists. Sparks fly after a British woman meets an American man at a London tea party, but how far will things go in this charming, cross-border romantic comedy set in 1927 London, England? “If you love the charming romantic comedies of the 30s and 40s (think Cary Grant, Jean Arthur, Jimmy Stewart and Carole Lombard), this one’s for you,” says Smith. There’s Always Juliet features an ensemble of Festival veterans including Scott Clarkson, who returns for his 8th season after a star turn in last year’s audience favourite, Same Time, Next Year; Festival newcomer Victoria Houser, a Toronto actor and singer originally from Halifax; Catherine Bruce (last seen here in the award-winning Arms and the Man); and Fraser Elsdon (from the Festival’s An Inspector Calls and Candida). Over 80% of the Festival’s summer audience is tourists, thousands of whom arrive in Perth annually to take in plays, as well as eat, shop, and stay overnight, boosting the local economy. The Festival also books some of Canada’s top theatre and film/television talent, with actors who have performed across the country and been seen on screens around the world. Over the past two years, the Classic Theatre Festival has also garnered a record-breaking nine Capital Critics Awards nominations for artistic excellence (more than any other company in Eastern Ontario, including the National Arts Centre), clearly putting Perth on the must-visit destination itinerary of many travelers. “One of the pleasures of an Ottawa Valley summer is Perth’s Classic Theatre Festival, which has an impressive track record for mounting quality fare,” enthuses Jamie Portman, one Canada’s most respected veteran theatre writers and a member of the prestigious Capital Critics Circle. The Festival’s summer season officially kicked off June 5 at Michael’s Table restaurant, where the Classic Dinner Theatre is staging the Shaw comedy Overruled. Seats for the brand new dinner theatre experience, which runs Tuesdays until August 28, are already 90% sold out, so those looking for “a most entertaining meal” should book soon. The summer will also feature two more classics on the mainstage – the mother-daughter conflict and gradual reveal of a family secret in Mrs. Warren’s Profession and the gripping tale of an unsolved murder, Angel Street (aka Gaslight). The annual historic walking plays return as well, with two World War II-era shows: The Prison of Petawawa runs at 11 am, Wednesday to Sunday from June 27, while Far From Home, a tale of Perth war brides, runs Thursdays and Fridays at 7 pm, starting July 5.